How to End Power Steering Problem easily. The Mega Power, Power Steering Service Treatment. Our Service Product that returns smooth, quiet steering quickly. Does your steering wheel turn jerky, is there a squeal? Feel a roughness or hang-up as you turn the wheel? Does it leak? Mega Power Ends those and these problem? Ends jerky turning Hang up Squeal Leak. And whine. Compare this products advantage to replacement part cost. A new power steering pump cost $400 to $600. The steering gear [rack] cost over $2000. Our method - is under $100 and ends the need for expensive $ part replacement repair. Directions included with your order, along with phone help. Delivered by FedEx in about 3 days. Order now - Give your power steering a life trouble-free again, and keep more $ in your wallet -by avoiding this costly repair. The Mega Power Treatment #PS-3. 3 item product treatment. Directions included with your order, along with phone help, guarantee. Delivered by FedEx in about 3 days. Just $75+$15 s&h= $90 total. Mega Power is the fix for rack and pinion foreign or domestic cars and equipment steering problems. End those jerky, turning Hang up, Squeal, Leak an Noise negatives with this Hi-tech, simple-to-use new product from Mega Power. Ordering info and actual directions anyone can follow - below. What this is fixing... Steering problems like a jerk or bind, or roughness, as well as a harder turning of the steering wheel is caused by a buildup of harmful residues in the steering valve control and resistance from growing amounts of friction abrasion in the cylinder. - Both of which cause those problems over time. Before those negatives reach the break point, use of Mega Power cleaners and conditioners removes those negatives and returns a former smoothness - ending the problem. If you read this far - this is what you're after! By the way, this same problem affects transmissions ... Service both - they probably are past due for service - and this will add the like new operation just new fluids can't. Clean and protect transmissions, or any hydraulic system like power-take-offs loss of fluid pressure on tractors and such. As well as a service product for power steering systems. For power steering, rough turning, squeal, leak fixes. The Mega Power Treatment #PS-3 is a 2 step treatment. Add to steering or transmission fluid. Then Remove. Remove by replacing old fluid with new. Add the next to product items to the new fluid - driving then finishes the remedy. Replacement of the steering rack or its pump runs easily to $2000. That a good way to fix your problem! For under $150 you can use this fix service to fix the internal problems and recondition the various parts chemically with a cleaner and slippery protective for under $150 for both steering and transmission. This product is also installed to service automatic transmissions as well as power steering. Order Mega Power "Engine" "Transmission" "Radiator" and "Power Steering Treatments" for complete servicing of those units. A $330 value for $200 IF ORDERING TODAY! Guaranteed to please PREMIUM SERVICE PROTECTING and HELPING your cars run better - LONGER! A $330 value - Now $200 while 100 sets, set aside for this offer last. Save $130. Just $200 an Free Shipping! Directions for ending power steering problem. There are two steps to using the power steering Treatment. The rinse refill step uses the 2nd & 3rd products included. Begin: Remove the old power steering fluid from its PS reservoir - using a suction gun [$5, most parts stores], and add the 12 oz MP Cleaner in its place. Start motor, turn steering wheel all the way left to right 4 times. Stop motor, remove the dirty fluid and refill reservoir using the ATF Fluid. Again Start motor, turn steering wheel all the way left to right 4 times. Stop motor, remove the dirty fluid and refill reservoir using the ATF Fluid. Again Start motor, turn steering wheel all the way left to right 4 times. Stop motor, remove the dirty fluid and refill reservoir with the two Mega Power products. And top off using the ATF Fluid, if needed. More Mega Power will fix wear, residue, and friction caused problems - 90% of all power steering problems. That ends the service. Check that the fluid level is OK.
Small systems like a four cylinder car and some 6 cylinder cars may only require a half bottle of each of the 2 Mega Power products. You can tell by the reservoir size. As you Drive leak and roughness, and whine problem disappears. Enjoy Mega Power as it keeps your cars going strong again. A simple, very effective, 2 step method that works fast. Includes Flush Conditioner, System Rinse, Anti-wear, Stop leak and Seal Conditioner, Easy-to-follow directions. Guarantee. Phone help, if needed. Shipped FedEx to your door in 3-4 days. Both Mega Power Power Steering Service 3 part Kit. #PS3-10, and 2 part PS#2 price. $60+ $15 s&h= $75 total. Request 2 or 3 part treatment. To ask a question, or to order,`Call 1 512 665 3388 This quick-service treatment works every time. At your local auto repair place, repair expense for a power steering repair can run from $450 to nearly $2,500. This Problem Solver from Mega Power, if installed by a mechanic who knows about it, runs about $195 for the product and service that goes with it. Comes with a one year guarantee. in about 20 minutes in your driveway - no tools needed, for half that! Just $75. Its easy, its foolproof, and its also guaranteed one year! Do it yourself... In your driveway in less than a half hour. This "treatment" will help you avoid having to fork-over $1000 to $2500 to replace some expensive steering parts. This is because most power steering systems just need this "tune up chemistry" from Mega Power - TO FIX IT? The Mega Power Power Steering Service 3 part Kit. #PS-10 A simple, very effective, 2 step method that works fast. Includes Flush Conditioner, System Rinse, Anti-wear, Stop leak and Seal Conditioner, Instructions, Guarantee $60+ $15 s&h= $75 total. Shipped Fedex to your door or business. Fleet and auto repair. Case of 4 kits, for 4 cars, or two large trucks with 1-3 gallon P S fluid capacity. $160= $40 s&h= $200 total. Shipped Fedex to your door or business. I've seem this "treatment" correct the problem in dozens of cars, and even one big road grader. I have many garages stocking the product in inventory so its on hand just for this reason. This simple service avoids the need for an expensive repair. The following procedure describes the two-part, simple way me, and lots of mechanics, and individuals install to fix this annoying steering problem. Doing so nearly always avoids an expensive repair. IF NOT, IT LESSENS IT SO ITS NOT A PROBLEM ANYMORE. It is the easiest and only way I know to correct those steering problems - in a half hour time. Its easy to install. Results occur quickly. This Mega Power Treatment #PS-3 is a 3 item product Kit. There are two steps to using the 3 products. A flush and rinse step. Refill with 2nd &3rd products & new fluid; included. It comes with a special 12 oz cleaner conditioner, and 32 oz replacement fluid - which is used as the flushing fluid also. A Oil Treatment for wear treatment; 12 oz. Works on all vehicles. Large size equipment need 2 treatments. Begin: Remove the old power steering fluid from its PS reservoir - using a suction gun [$5, most parts stores], and add the 12 oz MP Cleaner in it place. Start motor, turn steering wheel all the way left to right 4 times. Stop motor, remove the dirty fluid and replace using the 32 oz replacement fluid to refill. Again repeat the above 3 to 5 times or so. Each of those times, stop motor, replace dirty fluid until finally the last of the contents 32 oz fills the reservoir. That's it! Simple. Effective. As you Drive the problem disappears. Enjoy Mega Power at work! A simple, very effective, 2 step method that works fast. Fleet and auto repair. Case of 4 kits, for 4 cars, or two large trucks with 1-3 gallon P S fluid capacity. $160= $40 s&h= $200 total. Garages and mechanics order our entire line at wholesale. Call me at 512 665 3388 to have filters and products shipped to your business. Visa M/C. Instruction for you and employees provided along with marketing material at lo-cost. ASK ABOUT OUR MONTHLY SPECIALS FOR MORE WAYS TO PROMOTE YOUR EXPERTISE AND YOUR SERVICES TO MORE CUSTOMERS. Power steering Home Page Index The Mega Power, Power Steering Service Treatment. A new PS service product that ends PS problems, too! Does it leak? Mega Power Ends those and these problems. A new power steering pump cost $200 to $500. The steering gear [rack] cost $600 to over $2000. This - under $100 service product avoids the need for an expensive repair. Mega Power's combination of flush conditioners, cleaners, friction modifiers, and their MC+ protective, slippery coating is what works! Ideal for rack and pinion, or steering gear box systems; foreign or domestic cars and equipment. Any of those conditions will end with this Hi-tech, simple-to-use new product from Mega Power. Ordering info and actual directions anyone can follow - below. Steering problems like a jerk or bind, or roughness, as well as a harder turning of the steering wheel is caused by a buildup of harmful residues in the valve control and by friction abrasion - both of which, this Mega Power Product removes, and the Treatment quickly ends. Works in transmissions; any hydraulic powered system like tractors have, and such. Mega Power Power Steering Tune Up Treatment Product Ends Steering problem. 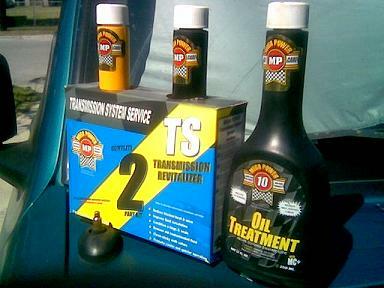 Pour the Yellow color product, the MP Flush Conditioner into your power steering reservoir. A $4 suction pump, sold at parts stores, is needed to remove the old fluid, to make room for the MP flush conditioner. Start motor, turn steering wheel all the way right, then all the way left - repeat twice. Stop motor. Remove all the fluid in the PS reservoir and refill with any good transmission or steering fluid. Repeat the right to left cycle, drain and refill like in #2, above. See if you can get 3 or more changes of fluid from the drain and refill cycle from a quart of ATF Fluid. After 2 to 4 DRAIN, refill cycles, have the reservoir empty of fluid, and refill by now adding 1/2 of each of the 2 black product items in the treatment. That should fill the reservoir. Drive as usual. The healing process that caused your problem will subside and disappear. Add the other two half full products to your motor or transmission. The one that needs the most protection. That is the way to service any power steering - which should be done every 4 years - along with your transmission and radiator, every 2 years. If you love your car and avoid a hit to your budget! Includes Flush Conditioner, System Rinse, Anti-wear, Stop leak and Seal Conditioner, Easy-to-follow directions. Guarantee. Phone help, if needed. Shipped FedEx to your door in 3-4 days. The Mega Power Power Steering Service 3 part Kit. #PS3-Just $60+ $15 s&h= $75 total. This quick-service treatment works every time. $60+ $15 s&h= $75 total. Shipped FedEx to your door or business.